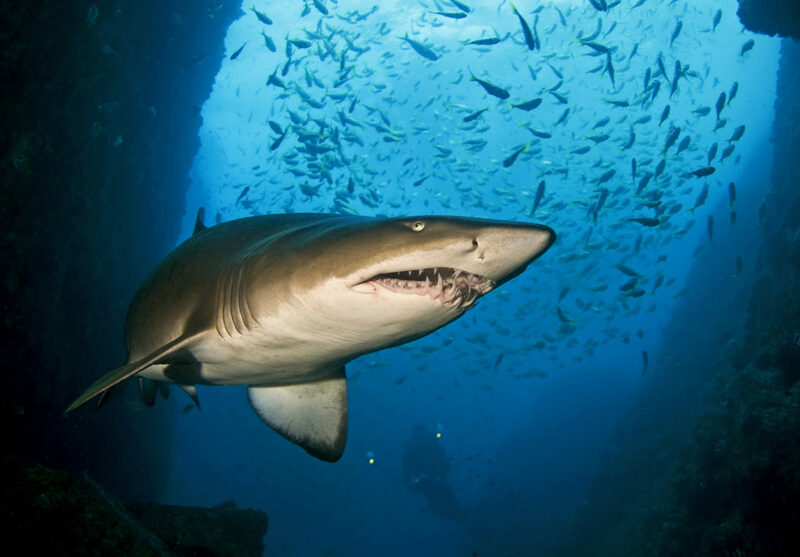 Globally, the Grey Nurse Shark is listed as vulnerable. Two populations exist in Australia: an eastern population (critically endangered) and a western population (vulnerable). Our scientists are playing a key role to derive a population estimate for the eastern population to assist ongoing management and recovery of the species, and determine if protective measures are working. Grey nurse sharks are known to form large groups at specific sites along the east coast of Australia. It is from these groups that we have taken DNA tissue samples and applied a technique called close-kin mark-recapture to identify the parents and genetic relationships between the sampled individuals to help us estimate how many there are. A large number of related individuals’ means there are fewer adults, translating to a smaller population. Conversely, fewer related individuals’ means there are more adults, and a larger population. Using this innovative genetic approach, we estimate that the eastern Grey Nurse Shark adult abundance is about 1,700 to 2,200 individuals, a slight increase in population size since 2010. These results indicate that protective measures are working. Close-kin mark-recapture has also been used to estimate white shark numbers and Southern Bluefin Tuna too. A SCUBA diver approaches a Grey Nurse Shark to obtain a tissue sample. Photo credit: David Harasti. 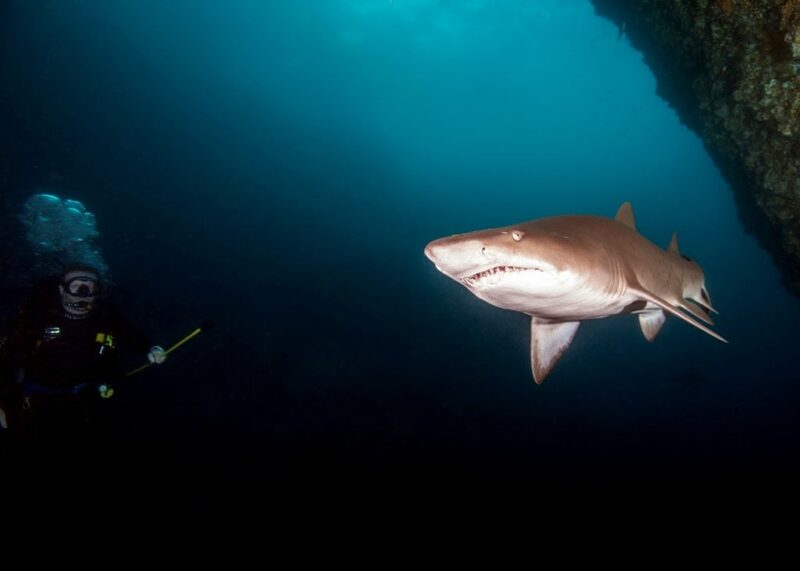 Grey Nurse Sharks can reach a length of 3.2m and like to cruise around sandy bottoms and rocky caves, and close to reefs and islands, to a depth of at least 230m. Grey Nurse Sharks have rows and rows of teeth that are razor sharp. However, even though they are well-equipped with an abundance of teeth, they aren’t a threat to you if you are in the ocean swimming, diving or surfing as they are not aggressive in nature and will only attack if provoked. They aren’t fussy on diet with a preference for a smorgasbord of fish, smaller sharks, octopus, rays, squids and crustaceans like lobsters. Grey Nurse Sharks become most active at night. They are slow moving but strong swimmers. It is thought that male sharks may live for up to 30 years and female sharks for 40 years. Male sharks reach sexual maturity between 6-7 years of age, and females at 9-10 years. The gestational period is 9-12 months and cannibalism can occur between grey nurse shark pups when in the womb. It is thought that Grey Nurse Sharks breed only once every two years. This means they are slow to recover from population loss. This new population result aims to assist with the ongoing and effective management of Grey Nurse Sharks. We are partnering with government and universities to do this including the National Environmental Science Program Marine Biodiversity Hub, Office of the Threatened Species Commissioner, Department of Environment and Energy, New South Wales Department of Primary Industries and University of Queensland. Congrats to CSIRO for conducting this important research so evidence based decisions can be made to successfully protect our environment.